He was an English adventurer who travelled to Persia with his brother; she was a Circassian princess. It was the late sixteenth century, a time when crossing from England to the Middle East would have taken many months and was fraught with risk. So it was by no means guaranteed that the two would meet – and yet they did. These portraits of Teresia Khan, Lady Shirley and Sir Robert Shirley were painted by Anthony van Dyck when the couple visited Rome, and are now owned by Petworth House, a National Trust property in West Sussex. Together they tell the extraordinary story of a union created across different continents and cultures, and of the beginning of a new relationship between England and the East. When we in Britain think of the sixteenth century, we tend to think about the upheaval that took place here and throughout our most immediate neighbours: Henry VIII and the break with Rome (and, of course, his numerous love interests); skirmishes between England, France and Spain; Lady Jane Grey; ‘bloody’ Mary; and, finally, the Elizabethans. Underpinning all of this was the tension and back-and-forth over the Catholic and Protestant faiths, which came to a head in 1558 when Elizabeth I took the throne and English Protestantism became entrenched. However, a recent book by Jerry Brotton, The Sultan and the Queen, asks us to look beyond Europe. The condensed version of the story he recounts starts with Elizabeth I’s excommunication by the Pope in 1570, meaning England became distanced and isolated from mainland Europe, something of a rogue state. Elizabeth needed other countries she’d be able to trade and form treaties with. Thinking pragmatically, she started to send envoys to more far-flung lands, establishing contact everywhere from Marrakech to Constantinople to Isfahan. Reaching out to these countries was largely successful: after the defeat of the Spanish Armada, Elizabeth earned the nickname 'Sultana Isabel' from the ruler of Morocco, and by the end of her reign there was a significant network of trade and diplomacy established with the Muslim world. The painting below depicts a Moorish ambassador to the queen, and explains why Moors were written into numerous theatre productions of the time – most famously, in Shakespeare's Othello. It was in this new environment, in 1598, that the brothers Anthony and Robert Shirley travelled to Persia (the forerunner of Iran), ruled at that time by the Safavids. The Safavid dynasty was sprawling and successful, one of the most influential in Iran’s history: it lasted just over 200 years and covered land including modern-day Iran, Iraq, Georgia, Azerbaijan, Afghanistan and Bahrain. At the time of the Shirley brothers' arrival it was presided over by Shah Abbas the Great, and Teresia Sampsonia (as Teresia Khan, Lady Shirley, was born) was the niece of one of the shah's wives. 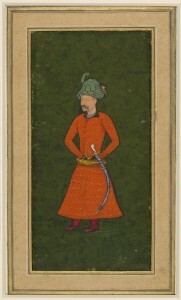 The Shirley brothers managed to ingratiate themselves with the shah, becoming military advisors in his battles with Ottoman forces. Anthony departed a year after their arrival to travel to Moscow and around Europe as the shah’s representative, seeking further alliances against the Ottomans; Robert Shirley remained, and met Teresia Sampsonia. The couple fell in love and married, staying in Persia until 1608, when they were sent by the shah on a diplomatic errand to James I and other European princes. They became prolific globetrotters, touring Moscow, Poland, Lisbon, Hamburg and others in between. The birth of their child in 1611 didn't slow them down: baby Henry, possibly the first ever Anglo-Persian born in England, was turned over to the care of his godparents, the Prince of Wales and Queen Anne, and the Shirleys continued on their travels. 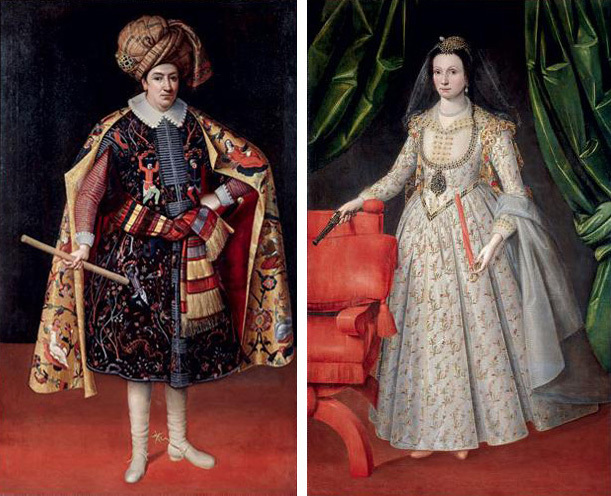 In the portrait below, the artist has had fun with the Shirleys’ identities: depicting Robert in traditional Persian dress, and Teresia as European, carrying a pistol: possibly a link to the story of her saving her husband’s life from bandits on the road. It was on Teresia’s last diplomatic mission with her husband that the Van Dyck paintings were made. The couple met the artist in Rome, when he was aged just 23. It wasn't the first time an artist had been captivated by the couple – as well as paintings, Teresia appears as a character in plays and literature. The couple returned to Persia in 1627, and were generously received by Shah Abbas, to the disgruntlement of other nobles and grandees in court. Robert Shirley caught a fever and died in Qazvin (the then-capital of Persia) in 1628, leaving Teresia alone and persecuted by grandees at court. Three years later, she left her home country for good and finally settled at the Carmelite Church of Santa Maria della Scala in Rome, tying herself firmly to her Christian faith and devoting the rest of her life to religion and charity work. She had Robert’s remains transported from Isfahan to Rome and reburied in the same grave she was also eventually buried in, when she died in 1668.